Our mission at SPECULAR is to provide High Quality Painting and related services as well as Outstanding Customer Service. We specialize in “NICHE” Products and Markets that in the past have had limited options when it came to outsourcing the added value process of Applying Paint. 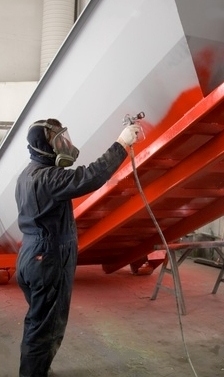 We have the capability to provide Air Dry, Low Bake and High Bake paint systems. Our Quality System is both QS9000 and ISO Compliant! The paint processes at SPECULAR Meet and Exceed some of the Toughest Specifications in Industry today including OEM Automotive World Specifications and AERO SPACE Industry Specifications. Our customers include General Motors, Ford Motor Company, Pratt & Whitney, and Textron Lycoming just to name a few. What SPECULAR brings to the Customer-Supplier Partnership is over 25 years of experience in the Preparation and Application of Paint. By leveraging our knowledge and systems for YOUR PRODUCTS you can be assured of a robust painted surface that will meet your specifications and withstand the rigors of daily use on Land, Air or Sea. Our Customers look to us to handle ALL of their paint related needs; Generally speaking they provide us with a Specification and tell us to “handle it”. SPECULAR can handle all of your painting and related needs, if we do not have a specific paint related technology in-house we will handle your project by outsourcing different operations. This will free up your time to handle your core competencies and you will have single source accountability with SPECULAR. Additionally SPECULAR is AGILE and most often can provide same day project evaluation and turn Quotations or one off Samples in 24-48 hours. If your product requires cleaning, conventional spray painting, masking, powder coating, Electrocoating, Polishing, Printing, Hydro-Graphics, Assembly, testing, sorting or Packaging Consider SPECULAR your Source!